Syllabus of the Online Course (Subject): Trade in Services. 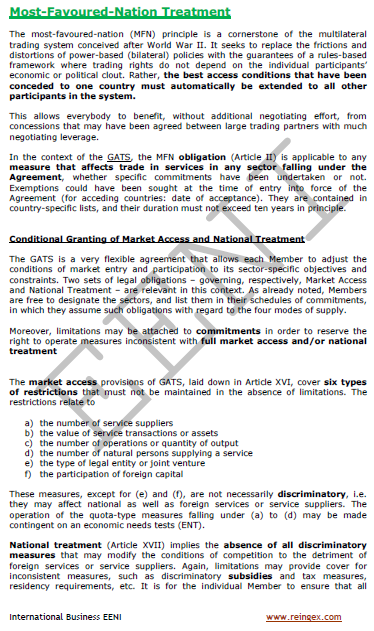 General Agreement on Trade in Services (GATS). 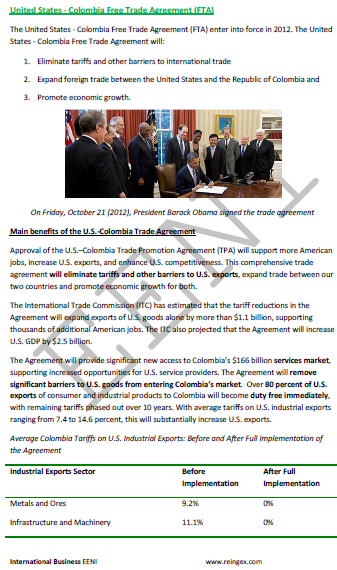 Case Study: Trade in Services under the United States-Colombia FTA and the European Union-Mexico FTA. Learning materials in (or Comercio de Servicios Commerce de services Comércio de serviços). Since 1995 the General Agreement on Trade in Services (GATS) is in force whose main objective is to liberalise foreign trade in services (exports and imports) transparently to increase the world trade. 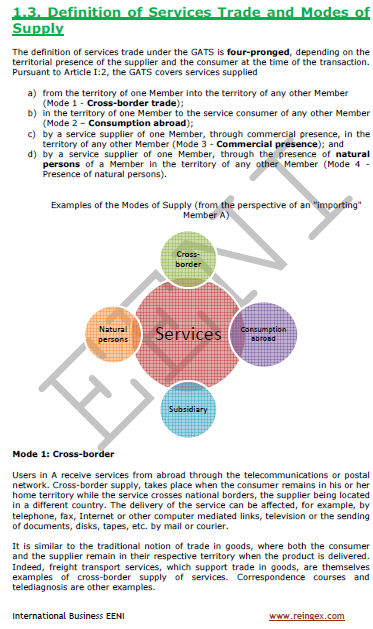 The General Agreement on Trade in Services (GATS) covers all exportable services (the WTO identifies twelve basic sectors and 160 sub-sectors): tourism, business services, information technology, transport, finance, education, architecture, telecommunications, healthcare, insurance, construction, engineering, distribution, environmental, cultural, and sporting services. The General Agreement on Trade in Services (GATS) seeks to promote trade in services of developing countries. In the developed economies, the services sector accounts for an average of 70% of GDP, while in developing countries is often below 50%. The United States is the largest global services exporter (14% of the total), followed by the United Kingdom (6%), Germany (6%), China, France, India, Japan, and Spain. Under the General Agreement on Trade in Services (GATS) the most- favoured-nation may apply. The General Agreement on Trade in Services (GATS) is perfectly compatible with Regional Trade Agreements (RTAs): Free Trade Agreements (FTAs) and Economic Partnership Agreements (ACE). In many FTAs usually, we will find chapters on trade in services and labour markets so that we will analyse the US-Colombia FTA and the EU-Mexico FTA.